The Internet of Things (IoT) is the DNA of modern industrial operations. It establishes a framework to securely connect and collect data from diverse remote assets, delivering information as well as channeling information to business applications. It is the inter-networking of physical devices, vehicles, buildings and other items – embedded with electronics, software, sensors, actuators, and network connectivity that enables these objects to collect and exchange data. IoT has had an evolution into the oil and gas pipeline industry. As the technology and deployment of the IoT progressed on to pipelines it provided increased ability to connect, measure and analyze an ever-increasing variety of behavioral statistics. This real-time data was then collected and stored in on-line databases, which then became a key source for many pipeline applications – ultimately increasing the amount of business analytics that could be performed. In the pipeline sector, this data has evolved to include parameters for optimization as well as information relative to pressure cycles, corrosion and pipeline conditions, and equipment. Environmental monitoring: SCADA based applications leverage the IoT using sensors to monitor and improve environmental protection by measuring air or water quality, in stations and strategic locations. Infrastructure management: Monitoring and controlling operations on pipeline infrastructures like pumping or compressor stations, pipeline pressures, terminals and tank farms are key application of the IoT. Enhancing operations controllers: How do you bridge the gap as a highly skilled but aging workforce moves to retire and new, younger workers replace them? Provide more meaningful information to their consoles. Younger employees are often more comfortable in the electronic environments of a controller console, so it can be as straightforward as providing better analytics with the information needed to deal with real-time scenarios. Energy management: Using applications connected to the IoT gives pipeline operators and energy managers access to precise cost data that instantly monitors energy usage costs to make confident decisions that optimize energy efficiency, improving the bottom line and reducing greenhouse gas emissions. The list of benefits for the Internet of Things to organizations is long, but that doesn’t mean they come without new challenges. Some of the main challenges revolve around issues of security, scalability and device constraints. With the critical infrastructure of pipelines and always increasing number of devices and systems connected to parts of the IIoT, security becomes not only a responsibility for IT, but a critical requirement that spans up and down entire organizations. In addition, as real-time data point counts continue to grow, better tools for configuring and managing large data need to become part of real-time systems. Furthermore, not every sensor, end device or RTU on a pipeline is smart or capable of becoming so – nor are they cheap to replace. In order for different devices to function in the same space, infrastructure will have to co-exist with legacy devices as they evolve to a smart infrastructure that exponentially transitions to all-encompassing IoT capability. One thing is for sure – the pros undoubtedly out way the cons of oil and gas pipeline integration into the Internet of Things. 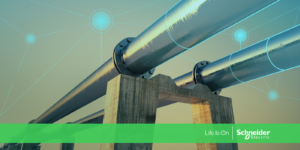 For enterprise pipeline operations, the benefit of IoT lies in the ability to link automation systems with enterprise planning, scheduling and product lifecycle systems in order to enable greater business control. Pipeline management systems are realizing more and more of these benefits as automation systems become further integrated with overall enterprise applications. By instituting a formal “smart infrastructure plan” that takes a predictive maintenance approach, using either internal resources or third-party providers, operators can substantially improve equipment performance, reduce energy costs, and operate a greener business. As the IoT continues to grow, the convergence of energy, automation and software is accelerating. This allows for the delivery of more advanced technology and innovation at every level, enabling the common goal of making the pipeline industry more connected, safe, reliable, efficient and sustainable for today and for future generations. With a whopping $7 billion spent by the energy market on IoT solutions in 2015, this won’t be the last time you hear about the Internet of Things in the pipeline management industry.